The Dow Jones Industrial Average rallied higher this afternoon as traders absorbed a fresh round of economic data and speculated on the timing of the Federal Reserve's next interest rate hike. U.S. consumer spending increased by 0.3% in July, matching economists' expectations. Meanwhile, inflation is rising. The personal consumption expenditures (PCE) price index, the central bank's preferred inflation measure, increased by 0.1% during July. The index has increased to 1.6% over the last year, shifting closer towards the Fed's target of 2%. On Friday, Federal Reserve Chair Janet Yellen suggested that the central bank may alter its inflation targets when considering a change to interest rates or other matters related to monetary policy. While markets are speculating on the timing of the next rate hike, all eyes will be on the U.S. Labor Department this week. On Friday, the federal agency will announce the unemployment rate for the month of August. The Dow gained more than 107 points after a strong performance from financial stocks and material stocks. 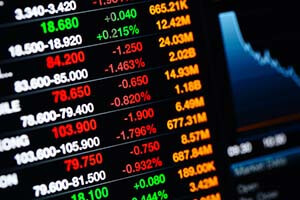 The Dow received a solid boost from Wells Fargo & Co. (NYSE: WFC), which gained more than 2.5%. Shares JPMorgan Chase & Co. (NYSE: JPM), Bank of America Corp. (NYSE: BAC), and Goldman Sachs Group Inc. (NYSE: GS) all ticked up more than 1% on the day. Financial stocks pushed higher due to increased expectations of a Fed rate hike in September. The odds of a rate hike have surged over the last week after Federal Reserve Chair Janet Yellen's speech in Jackson Hole. Money Morning Capital Wave Strategist Shah Gilani offers three ways investors can make sure that their savings continue no matter what the Fed decides to do with interest rates. Read his insight, right here. Oil prices were sliding again on Monday on news that OPEC production continues to rise. Investors are increasingly worried about another supply glut weighing on prices. The West Texas Intermediate (WTI) crude oil price today fell 1.4%, while the Brent crude oil price slipped 1.3%. Here's more on why crude oil prices were falling on Monday. Investors continue to speculate on the possibility of a production freeze by OPEC. The global oil cartel is set to meet in September to discuss a possible cut to global output. However, Money Morning Global Energy Strategist Dr. Kent Moors has said that investors shouldn't anticipate a deal next month. Moors argues that a deal is coming, but it won't be the type that traders are hoping for in September. Here's his inside scoop on when and how OPEC will reach a deal. But the big story today was happening in the legal offices of Apple Inc. (Nasdaq: AAPL). According to Reuters, the European Commission is set to rule against the company's tax deal with Ireland and could slap the technology giant with a penalty of more than 1 billion euros in back taxes. Shares of Chipotle Mexican Grill Inc. (NYSE: CMG) pushed up more than 1.2% after the casual dining company announced a new promotion. The firm will give a free drink to high school and college-aged customers if they purchase an entrée in September. The company has been struggling to win back customers after a series of disastrous food-poisoning cases last year. Shares of Southwest Airlines Co. (NYSE: LUV) were up 0.5% despite news that the airline had a mid-air engine blowout on Saturday. The firm called the engine blowout an isolated incident, and the pilots executed a successful emergency landing in Pensacola, Florida. Shares of Herbalife Ltd. (NYSE: HLF) rallied more than 4.4% on news that billionaire investor Carl Icahn has purchased more company stock and increased his stake in the firm to roughly 20%. The news disputed claims by rival investor Bill Ackman that Icahn was trying to liquidate his position. The two have been engaged in a high-profile battle over the company. Ackman has argued that Herbalife's marketing model constitutes a pyramid scheme. Drug giant Mylan NV (Nasdaq: MYL) gained 0.5% after the firm announced plans to release a generic version of its allergy treatment EpiPen. The generic version would cost 50% less than its branded product. The firm has faced a firestorm of criticism in the last week after announcing sharp price increases to the EpiPen treatment.